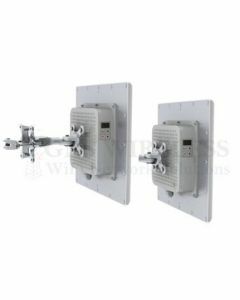 GNS Wireless offers complete wireless Ethernet bridge packages for connecting a building to building network or internet connection. 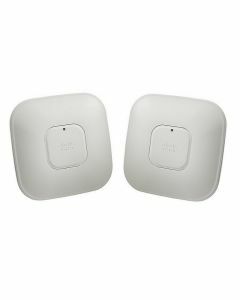 The pre-packaged 802.11N, point to point wireless Ethernet bridge kits are pre-configured for "out of the box" installation. 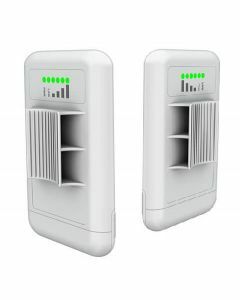 With a point to point bridge kit, you will have the ability to share internet wirelessly between two or more locations. 802.11N bridge kits can also be used to share voice/video and data. Extend your home's wireless network by first deciding distance, then speed requirements, and whether or not you have clear, unobstructed line of sight between your two locations. The 802.11AC speed will allow gaming applications such as Xbox 360 to run without any delay. 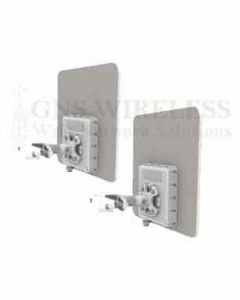 The wireless Ethernet bridge operates as a transparent link, or layer 2 transmission. It is similar to an invisible Ethernet cable connecting your two locations. When the antennas send the information between one another, WPA/WPA2 encryption is enabled for security. It also has ability to enable MAC address authentication so that only the two access points are able communicate. You can hide the network SSID, and because the beam width of the antennas is directional, (about 16° or less) the signal is not broadcasted in all directions, only in the direction you aim the outdoor antenna. Furthermore, mount the antennas as high as possible to further reduce interference. 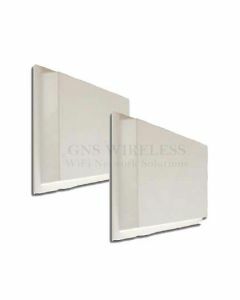 GNS Wireless Ethernet Bridge antennas are pre-configured for "out of the box" installation and operation. 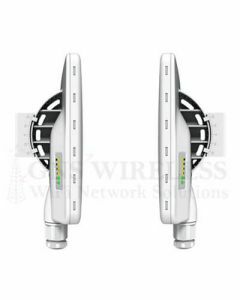 Most of the 802.11N radios have external Signal LED's will assist with alignment and troubleshooting procedures. Maximum cat5e cable to be used on each end is 290ft. (Shielded cat5e is recommended). 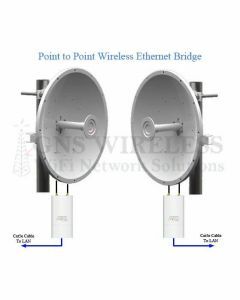 To connect the wireless bridge antenna to your network at each location, a single Cat5 Ethernet cable is used. The Cat5 Ethernet cable connects directly from the outdoor access point using a weatherproof grommet, to an indoor POE (Power-over-Ethernet) injector. The POE injector plugs into a standard AC outlet for power, and another Cat5 Ethernet cable connects from the POE injector to your network (Router/PC/Switch etc.) In order to run multiple computers, or phones at the remote location, connect a switch to the antenna. You then have the option of connecting a 802.11AC wireless router, for Wi-Fi access. 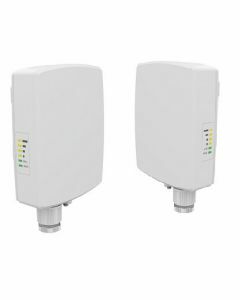 With clear, un-obstructed line of sight between your two locations, a maximum range of 5 miles can be achieved using some of our more popular 802.11N wireless Ethernet bridge packages. Using the frequency of 5.8Ghz will work great for most applications. The directional antennas reduce interference, and the bridge antennas will be set to automatically select the best channel. Adjustable transmit power and channel width allows you to further adjust link quality. 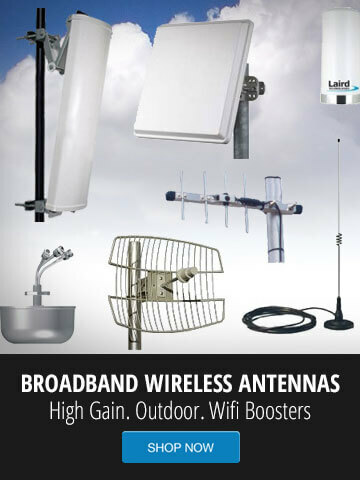 Most antennas have a 24-29dBm maximum output power. This works great for long distance Point-to-Point applications, as well as Client applications. Power can be scaled back for closer installations to avoid noise issues and to meet local regulatory requirements. 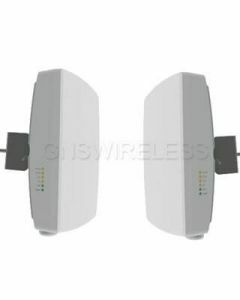 For non line-of-sight application we stock a variety of 900 MHz Wireless Ethernet Bridge package. 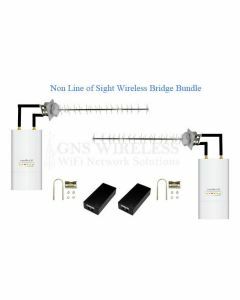 If you have any questions about 802.11N Point to Point Wireless Network Bridge Kits or any GNS Wireless products, please contact us by calling (877) 209-5152 or email us at support@gnswireless.com.